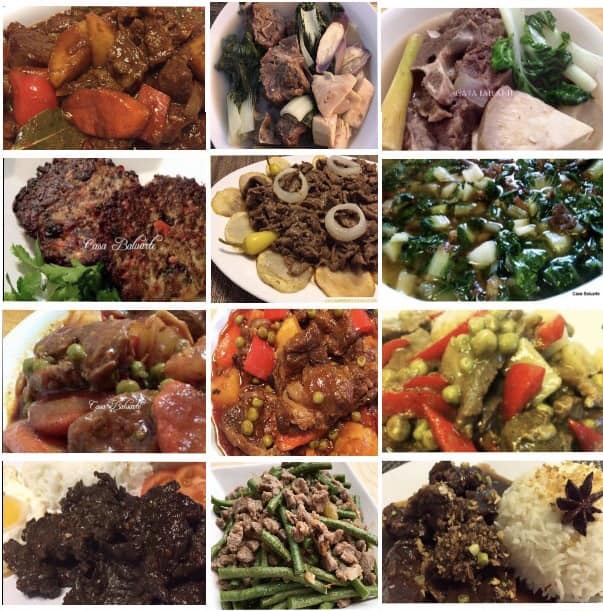 Here are the top 12 Filipinos favorite beef recipes. 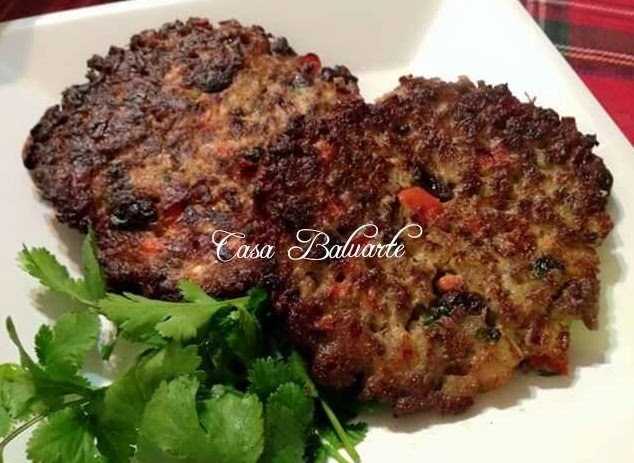 All recipes are cooked by your Casa Baluarte admin and enjoyed by not only family members but also friends and co-worker. Click on the recipe name link and it will direct you to the complete and step by step recipe. Give it a try and share. Let me know which one you like the best. Leave me a comment or a suggestion, I would love to hear from you. 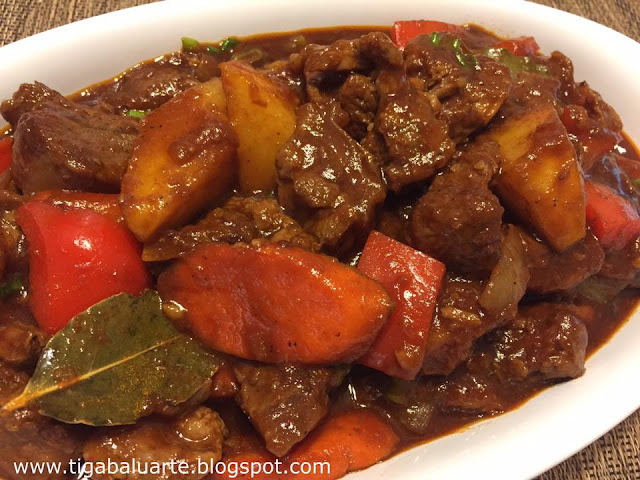 Beef Mechado is made by stewing meat in tomato sauce with potatoes, carrots and bell pepper. 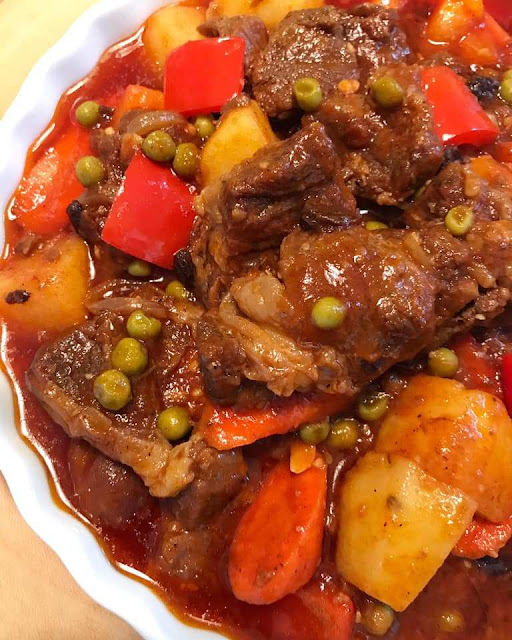 It is similar to Kalderetang Baka or Afritada because of the base ingredients. Beef Mechado is a delicious beef stew best eaten with steam rice or even bread. Beef Torta Giniling or Ground Meat Omelette is one of those easy to prepare kind of food to serve your family. Your choice to use ground beef, pork, chicken or even fish. If chances there are left over Tortang Giniling, grab some loaf of bread, spread mayonnaise and ketchup and you are set. You got yourself a delicious Torta Sandwich. Beef Kansi is an Ilonggo beef soup dish that is a cross between Bulalo and Sinigang. Beef are flavored with batwan, lemon grass and vegetables like green jack fruit, bok choy and eggplant. Batwan or Batuan is the original souring ingredients to this recipe but since batwan are hard to find when outside Ilonggo region, I used tamarind sinigang mix. 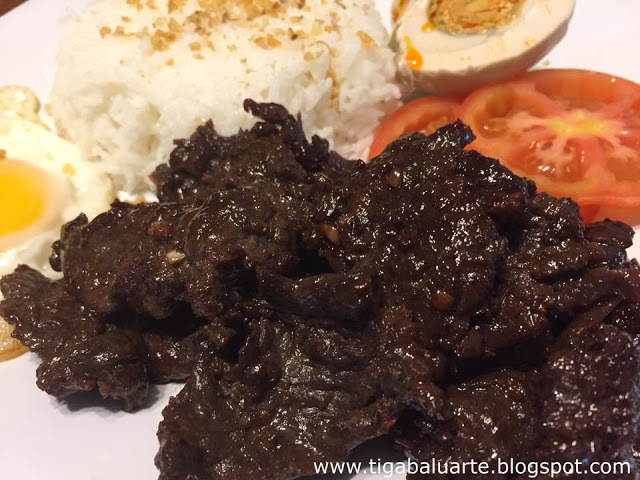 Beef Tapa is one of Filipinos favorite breakfast meat. Using sirloin beef sliced thin and marinated overnight before frying. Best when serve with eggs,slices of tomato and garlic fried rice. Check out the simple recipe here > BEEF TAPA, you will be amazed how easy to make a delicious Beef Tapa. Much more affordable and no preservative compare to store bought. Beef Bakareta or Bakareta is one of the popular and favorite Filipino dish during Fiestas or any special occasion in the Philippines. Some make this dish out of goat meat (Caldereta or Kalderera) but I myself rather stick to beef. 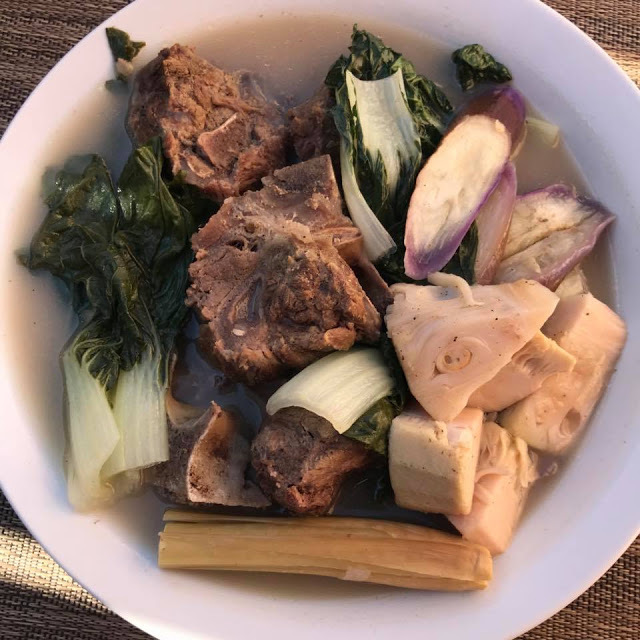 Sinigang na Baka is a simple Filipino Beef Soup. It is hearty , delicious and easy to make. Make sure the beef is boiled until tender, season and add vegetables. There are many ways on how to make sinigang and this is one of the simple one. You can add pretty much any vegetable you want like kangkong leaves, gabi, talong, okra and more. 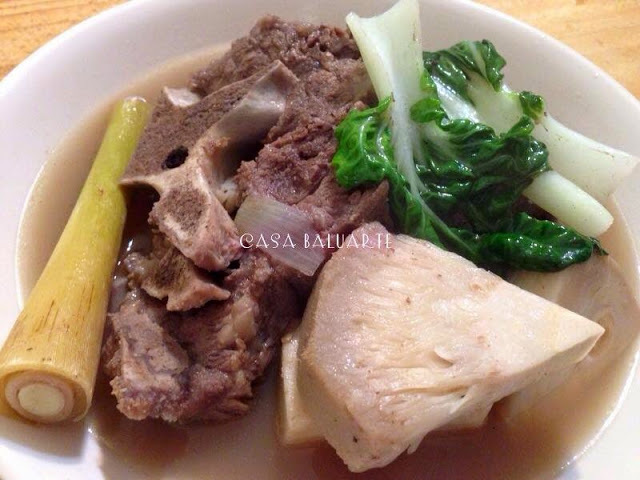 Click here for the recipe > SINIGANG NA BAKA and enjoy. Bistek with Potato is another way of cooking Bistek Tagalog. With this recipe I added fried potatoes and everyone liked it. Fry the potato crispy and top with Bistek Tagalog and fried onion. Give it a try. 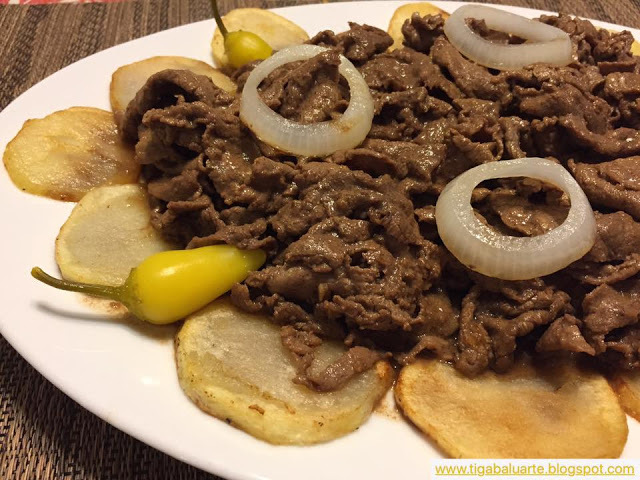 Complete recipe here > BISTEK TAGALOG WITH POTATO and share. Enjoy. 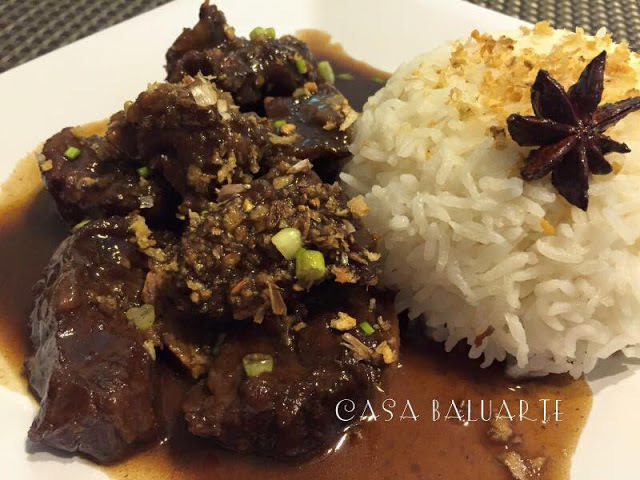 Beef Pares is a popular Filipino comfort food that is usually served with garlic rice and a bowl of soup. Juicy and tender slow cooked beef in sweet salty sauce seasoned with sesame oil. Beef Igado is an Ilocano dish but this one is my version. It is almost the same as Beef Menudo with no tomato sauce but with liver spread out of a can. You can also use fresh pork or chicken liver instead of can. Ginisang Pechay with Beef is a simple yet satisfying Filipino dish. It is an recipe and you can use ground meat, pork, chicken or shrimp. Something about this dish brings me back home to the Philippines. Simple, affordable and nutritious. 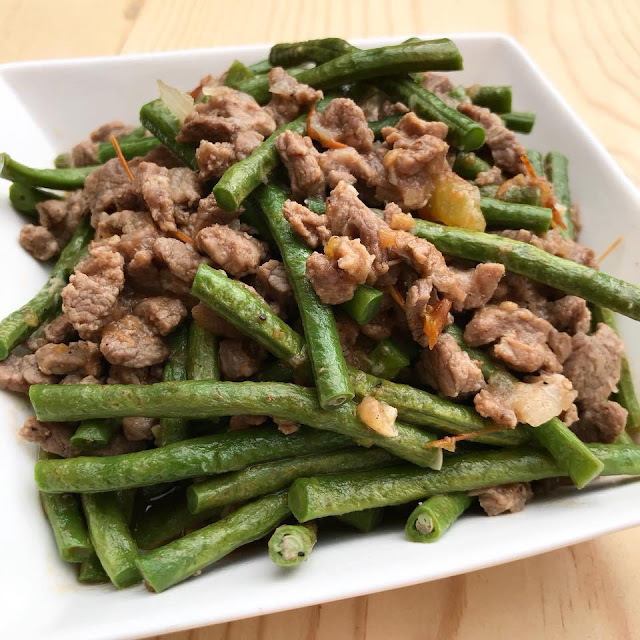 Ginisang Sitaw is an easy Filipino recipe and quick to make. When making, you can add other vegetables such as kalabasa and talong. You can also use chicken or pork or any ground meat desired. Simple ingredients needed and budget friendly. 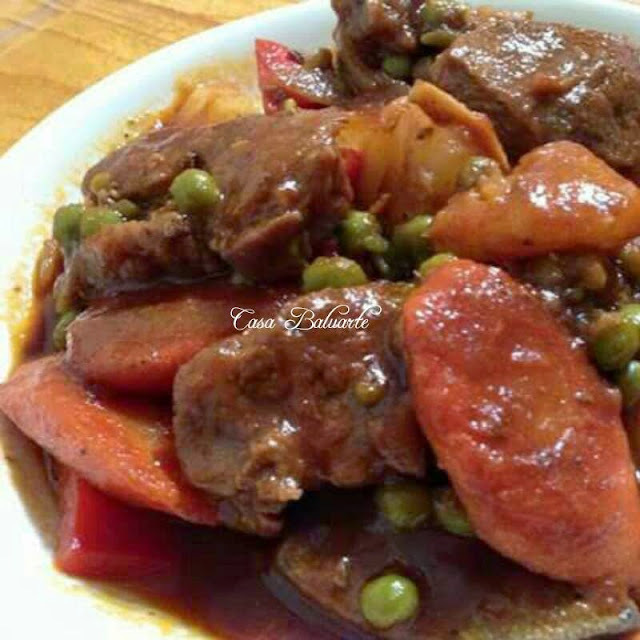 Beef Kaldereta is a popular Filipino dish specially for parties and holidays. It is also known as Beef Stew and Bakareta. It traditionally uses goat meat as the main ingredient but pork, chicken or beef may be used.